The Heraeus GoldSpot amalgam lamps are regarded as the market-leading product - primarily due to their long service life and unique Longlife technology. The extremely long-life high-performance low-pressure lamps achieve an up to ten times higher UV power density compared to conventional mercury low-pressure lamps and can be used at higher ambient temperatures (up to 90°C).Moreover, amalgam lamps are insensitive to temperature fluctuation. 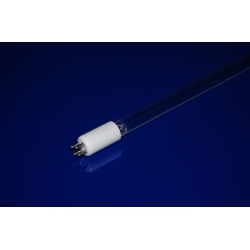 The unique Heraeus coating prevents the transmission loss of the quartz glass which is a disturbing factor in conventional UV lamps. The result is an almost continuous sterilisation effect over the entire service life of the lamp. Up to 90 percent of the UV-C output power is achieved even after up to 16,000 hours of operation. The Longlife coating is transparent, including for 185 nm radiation. Amalgam lamps can enable savings with regard to number of lamps, plant components, energy consumption and service intervals - and clearly reduce the operating costs of sterilisation plants due to their high output and long life. They save energy, generate very little heat and can be used as a low-cost alternative to medium-pressure lamps. Our flyer provides a comparison of the cost effectiveness of amalgam lamps. Additional VUV radiation is emitted at a wavelength of 185 nm if the light tube is made of ozone-generating synthetic quartz glass. With the optimal combination of quartz material and lamp technology, UV output at 185 nm can even be increased to five times that of a standard low-pressure lamp.